We Love Shrimp. Sometimes its like a scene from Forrest Gump here. Fried shrimp, boiled shrimp, blackened shrimp, grilled shrimp and anything but coconut shrimp ! This is one of my year round favorites! The Holiday season, is perfect for seafood. Besides being a nice break from all the dressing and turkey, its a great light appetizer or full meal! 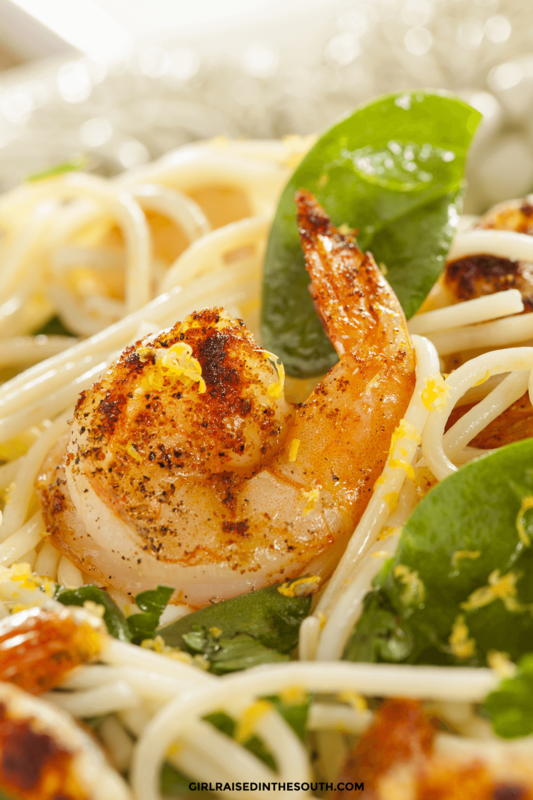 Add shrimp and seasoning in a zip loc bag with 2 Tbsp of olive oil let marinate in your refrigerator up to 2 hours. Thread shrimp, lemon and Bay leaves on the skewers. Coat shrimp liberally with seasoning. Add lemon juice and brush over shrimp. 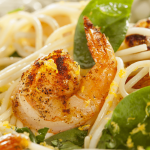 Serve over pasta and garnish with fresh basil, lemon wedges and fresh grated parmesan. Can be broiled in the oven for 10 minutes Watch Shrimp Carefully as they can overcook quickly.